In Russia, shopping malls are putting out American flag doormats for people to wipe their feet on, and there are stores that are selling toilet paper with the American flag imprinted on it. Surveys show that Russian attitudes toward the U.S. are now even worse than they were during the end of the Cold War, and ordinary Russians are blaming America for everything from the overthrow of the Ukrainian government to the collapse of the ruble. The Russian government has just authorized a new military doctrine which identifies the United States as a top threat, and commentators on Russian television are using extremely strong language to condemn the United States. In fact, one of the most prominent Russian commentators has referred to the United States as “the kingdom of the Antichrist“. Cold War has erupted, and they very clearly view the United States as enemy number one. But in the U.S., things are completely different. Most Americans feel absolutely no animosity toward Russians or their government. And most Americans do not consider Russia to be a “threat” whatsoever. In this country, “the Cold War” is a relic from the past, and our relationship with Russia is very low on the list of political issues. Most people seem to feel that the current tension between the U.S. and Russia is a temporary thing that will fade away eventually. Nobody is making Russian flag doormats or selling toilet paper with Russian flags on it. So most Americans have a really hard time grasping what is going on inside Russia right now. Even if they have heard about how much Russians hate us, they don’t really understand how this could be possible. If you talk to a Russian about the international political situation, sooner or later you will be informed that there is a country in North America that you never heard of. Its name is ‘Pindosia,’ ‘Pindostan’ or, more officially, ‘United States of Pindostan,’ and you will be told that one part of it, called Alaska , used to belong to Russia . Part of the word – ‘stan’ – stands for underdeveloped state, as in ‘ Pakistan ’, ‘ Kazakhstan ’ or ‘ Uzbekistan.’ The citizens of this country in plural form are called ‘pindoses’, in singular – ‘pindos’. The word ‘pindos’ in Russian is highly offensive, and defines a helpless creature that is a product of a very bad educational system, one who can survive in this world only with the help of different gadgets. The animosity that Russians have for the United States runs very deep, and it has been growing over time. Today, according to the respected Moscow ‘Levada Center,’ which measures political sentiment in Russian society, 74% of Russians have negative feelings towards the USA . It hasn’t always been like this – in the 1990s, 80% had positive attitude toward America. Right now 76% of Russians hate Obama personally and only meager 2% like him. 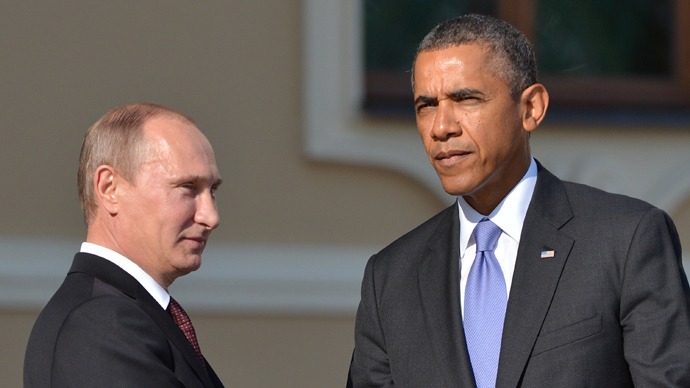 In 2009 only 12 % of Russians had extremely negative feelings towards Obama. What a difference a couple of decades makes. Russian business owners are using American flags as doormats as resentment over U.S. economic sanctions puts the squeeze on traders. Customers have been filmed wiping their feet on the fabled stars and stripes as they enter and exit stores across Moscow, as struggling retailers take a hopeless swipe at their Cold War adversaries. And as economic conditions get even worse in Russia, this anti-American sentiment will continue to grow. At this point it doesn’t even matter if Americans are really to blame for something or not. If something goes wrong, the finger will be pointed at the United States. Most Americans simply do not understand that anti-American sentiment is running extremely high all over the globe right now. A few decades ago, the United States was one of the most loved nations on the entire planet. Now it is one of the most hated. When it comes to foreign policy, Barack Obama has made mistake after mistake and he has been alienating lots of people. And as far as the Russians are concerned, the era of “friendship” with the United States is long gone. The trust that had been established between the two governments is totally broken, and they now consider us to be their number one strategic enemy.